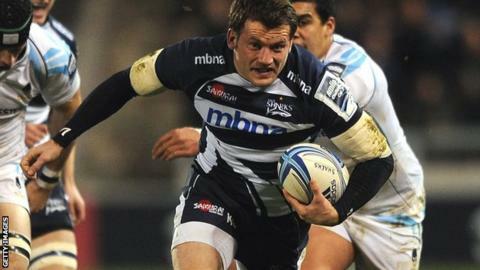 Sale Sharks and former England winger Mark Cueto has announced he will retire at the end of the season. The 35-year-old is the Premiership's all-time leading try scorer with 87 but has crossed only once this season. Cueto made his England debut in 2004, claiming 20 tries in 55 international games, and came within inches of scoring a try in England's 2007 World Cup final defeat by South Africa. He played once for the British & Irish Lions against New Zealand in 2005. Two years later Cueto nearly grabbed the headlines when he thought he had scored for England early on in the second half of the World Cup final, but replays showed his foot had just touched the line before he dived over in the corner. At club level, Cueto has made 294 appearances for Sale and scored 118 tries. "When I made my debut at Bristol back in 2001, I could hardly have dreamed that I would play for Sale Sharks for 14 seasons, represented my country all over the world and played with and against some of the all-time greats," said Cueto. The Cumbria-born winger, who had a spell as Sharks captain in 2010, was a keen footballer in his youth and played for South Cheshire alongside former Crewe players Kenny Lunt and Rob Hulse. Cueto only took rugby seriously aged 17 and worked his way through the Sale academy before scoring on his Sharks debut. He was a prolific try scorer in his early career and surpassed team-mate Steve Hanley's Premiership record in February 2013. As well as winning the Premiership with Sale in 2006, Cueto also won the European Challenge Cup in 2002 and 2005.